For Genesis themes, Install the Genesis "Title Toggle" widget. Activate it. Now, when you’re editing a page, you’ll see a box below the layout settings (this is below your content) where you can click to hide the title. For non- Genesis themes, install the “Hide Title” widget. Activate it. 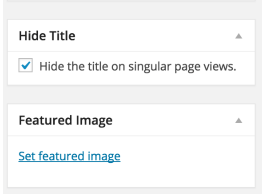 Now, when you’re editing your landing page, you’ll see a box above Featured Image where you click to hide the title.